Home / Posts Tagged "dental implants cost"
Now that you have had your dental implants, we believe you are delighted with the results. You have invested your money and time to have this modern teeth replacement option, so you should get the best out of it. We are here to help you understand how to care for your implant thus protecting your investment. Implants are one of the most successful teeth replacement options that look so natural. However, they need some care just like your natural teeth to maintain them in a healthy condition for a long time. To enjoy the successful dental implants throughout your lifetime, you should keep your mouth as clean as possible. From the next day of the surgery, you should start cleaning your other teeth with a toothbrush as you always do. However, avoid brushing in the surgical area for some days and be careful while cleaning this area. Rinsing in your mouth with warm salt water could help you feel better. Make sure the water is not so hot and hold the warm water over the surgical area for some time. Repeat this as often as you can. Try to keep the food you eat away from the surgical area for some days. Rinse the implant site thoroughly after every meal in order to keep the implant site clean. Do not smoke until the wound is completely healed because smoking can limit healing to a greater extent. What should you avoid after implant treatment? Take only cold drinks, avoid hot drinks or food for the first few days. Do not eat until the effect of local anaesthesia wore off. Try not to disturb the implant site with your fingers or tongue. Do not swill liquid on the area. Do not undertake any tough exercises for the first 48 hours post dental implant procedure. Will there be bruising or swelling around the implant site? You might experience some bruising and swelling following the implant procedure. This is completely normal and will subside naturally in a few days. However, you can use ice packs to reduce swelling and hold it on the cheek area for some time. Raising your head a bit while sleeping may also help. What about the sutures made in the tooth implants site? The stitches will dissolve after some days or weeks. You may experience some minor bleeding post surgery. However, this is perfectly normal. You can try applying pressure by biting down dampen gauze cloth over the area for a few minutes. Sitting in an upright position will also help. If bleeding continues for a long time, you should contact your dentist right away. If you are prescribed with antibiotics, to take after the procedure, ensure you complete the course. We want you to recover as pleasant and as smooth as possible. Following these instructions carefully can help you with it. If you have any questions or concerns regarding your healing phase or dental implants cost, contact your dentist! If you have missed your tooth or several teeth, it is essential that you replace your missing teeth as early as possible. Before you move forward with your treatment plan, it is better you take a few moments to consider the benefits of dental implants versus traditional dentures that are removable. Your oral surgeon or dentist will discuss with you the advantages and disadvantages of both the options including dentures and dental implants cost helping you make the better decision for your unique situation. Why is it vital to replace a missing tooth? When you miss at least one tooth and leave it without replacing, your full smile suffers. Following a tooth loss, the jawbone and gums do not receive the required stimulation. As a result, the brain redirects nutrition to other parts of your body. This can cause the jawbone and the soft tissues in your mouth to breakdown. Without supporting tissues, the teeth in the surrounding area start to shift which will eventually result in further tooth loss. By replacing a missing tooth, you are not only avoiding tissue loss but also help yourself eat a wide range of foods in order to maintain good oral and overall health. Dentures allow replacing many missing teeth with a single prosthetic. The base of the partial dentures is crafted to fit between the remaining healthy teeth where it grips to the adjacent teeth to support the prosthetics. Whereas, full dentures are moulded to fit to the gum line creating suction that holds the denture in place. One of the significant disadvantages with these removable prosthetics is that they should be replaced or refitted regularly for proper functioning. There are implant retained dentures available now which closely mimic natural tooth structure helping you experience improved tooth function and long lasting results. 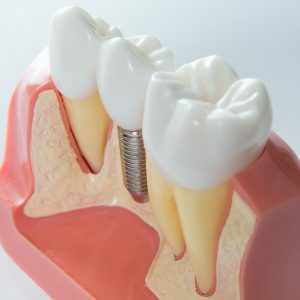 Dental implants are surgical structures which connect with the base of your jaw. A bridge, crown or denture is some of the dental prosthetics which can also be attached to implants. Dental implants undergo biological process osseointegration wherein the artificial implant forms a tight bond with your living bone. Once the osseointegration is complete, the dental prosthetic is added. The time for adding prosthetics purely depends on the healing time your body takes. Why are affordable dental implants the best? Dentures are reported to restore about only 20% of chewing ability whereas dental implants can restore your full chewing ability. This means after dental implants you can eat all your favourite foods. Denture should be replaced every five years or so, to ensure they function properly. Affordable dental implants are reported to last for a lifetime when they are adequately cared by maintaining regular oral hygiene. Besides, dentures need extensive care while implants just should be clean like permanent teeth. Dental implants are sure Golden standard of teeth replacement options available. 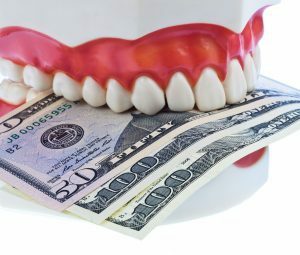 The cost of dental implant is also much affordable compared to the long run. Go for it to flaunt a full, happy smile for a lifetime. Losing a tooth can be a very traumatic experience, both financially and emotionally. In today’s world, people consider dental implant than other traditional bridges to replace it lost. If you have lost your teeth and thinking to replace it, consider dental implant option! Wondering why? Here are the reasons! Having Dental Implant Treatment than Traditional Bridges Improves Jawbone Strength! Dental implants will keep your jawbone strong. This is because, the dental implant don’t rely on support from adjacent teeth. Not Only Improves Your Oral Health But Also Your Overall Health! Unlike dental bridges, dental implants do not increase tooth decay, sensitivity or cause health issues like poor air breathing problem. But, the dental implant seamlessly integrates into your jawbone, so that it will be better than your natural teeth. Having Dental Implant Will Give a Natural, Beautiful Appearance That You Deserve! The dental implant looks and feels like a natural tooth, and crowns can be made with all-ceramic materials. So, it will give the look that you deserve. Dental Implant Have High Rate Of Success! Tooth implants provide a strong foundation for fixed or removable replacement teeth that are made to match your natural teeth. As a result, dental implants enjoy a success rate of between 95 and 98 percent. You Will Have Long Lasting Implant Teeth That Your Natural Teeth Can’t Be! Most patients who follow a regular oral hygiene regimen will expect their implants to last a lifetime. Big Reason Why You Consider Dental Implant than Traditional Bridges? One of the biggest reasons of dental implants is, high-quality dental implant should be expected to last a lifetime. They place less of a burden on the surrounding teeth and promote healing of bone structures and gums under the teeth. They also tend to reduce long-term risks posed to the jaw. The first step in the dental implant process is the development of an individualized treatment plan. The dentist will suggest a treatment plan based on the implant option that is best for you and discuss the dental implants cost. Next, during the procedure, the tooth root implant, which made of titanium, is placed into the bone socket of the missing tooth. The healing process will take from 2 to 4 months. Then, your dentist will make the new tooth, which match the color of the new teeth to your natural teeth, with the help of impressions of your teeth, and creates a model of your bite. Such replacement tooth, which is called a crown, is then attached to the abutment. Dental implants require the same care as real teeth, including rinsing, flossing, and brushing, with an antibacterial mouthwash, and the toothpaste, which your dentist recommend. So, what are you waiting for? Why not take the advantage of dental implant! Get in touch with your dentist to gift yourself a beautiful smile. If you have just received a dental implant or planning to get one, you should quit smoking, as it increases the risk of dental implant failure. The majority of the past and current researches implicate smoking as one of the prominent risk factors affecting the success rate of dental implants. Also, most of the studies report that the failure rate of dental implants in smokers is high when compared to non-smokers. These findings cannot be ignored, as smoking has a strong influence on the complication rates of implants as well. One of the most common questions many patients have about tooth implants is whether smoking affects dental implants. The short is Yes, especially, if you have undergone a bone graft procedure to secure your implants. People who smoke are at high risk of infection following surgery and may heal slowly. 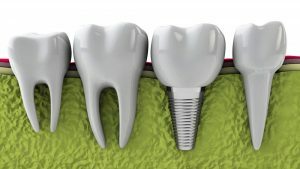 The dental implants cost is affordable, and are manufactured devices that are inserted into the jawbone, where they function as anchors for a crown or bridge. For dental implants success, they must have enough bone support. Smoking after receiving dental implants can lead to bone loss, and it can cause the bone to deteriorate. Smoking during the healing phase can cause pockets of inflammation around the implants. When it is left untreated, it leads to peri-implantitis which leads to bone resorption and ultimately implant failure. Moreover, smoking can reduce the blood flow and slows down the process of healing which can prevent the implants from fusing with the jawbone. Cigarettes consist of toxic chemicals that pose serious health risks. Among all other chemicals present in a cigarette, Nicotine potentially posses the significant risk of healing and tissue health. Studies show that nicotine constricts blood vessels that make it more difficult for oxygen to reach areas where healing is needed. If you are a smoker, here are a few suggestions to ensure that your dental implants are successful. It is easier said than done. But, you need to stop smoking as it is not good for your overall and oral health. When it comes to your health, what might be the better time than now to quit this habit? So, quit smoking today. If you are a chain smoker, the thought of smoking can be anxiety, and it cannot be done in a single day. So can you commit to quitting for at least two or three weeks before and after the procedure? Yes, you can! If you can’t think you can quit smoking, not even for a week, you can at least try to reduce. Even if you smoke half as much as you do right now, it can help improve the blood flow and increase the chances that your dental implants will be successful.